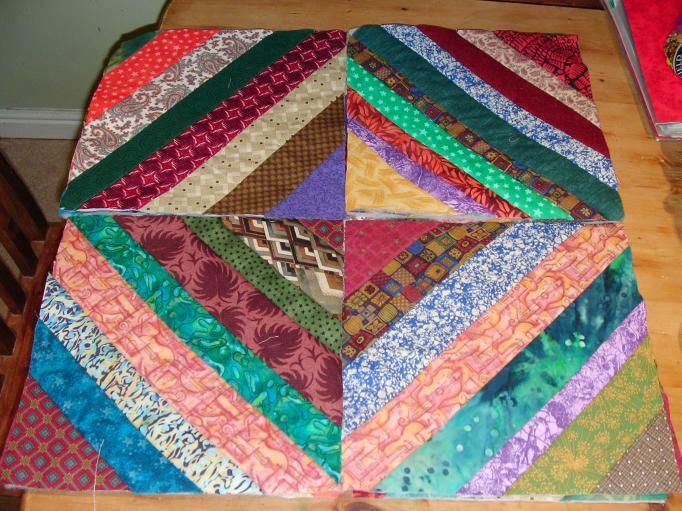 The HeartStrings Quilt Project group is making Quilt As You Go (QAYG) blocks for Jan MacFadyen of Victoria, Australia, during the months of March and April. She also has an excellent two-part Tutorial on the method used for constructing these blocks from strips of fabric (strings) and scrap pieces of batting. Good links, great blks!! And the stash report is pretty good too!! Thank you, Brenda. And I just saw some beautiful boxed stars on your blog! Great work! I started my blocks before Jan Mac mentioned she wanted *boy* quilts so they’re a mixture of boys and girls blocks but I know she’ll be able to use them all. Thank you, Mary. Jan’s doing a great job on those quilts, isn’t she? These blocks are so much fun to make. I just love to feel them after they are done. They’re like little mini quilts! Manly colors! I find myself struggling with that too!